Just wanted to quickly share my dining room chalkboard with you. I think it pretty much sums up the Thanksgiving holiday to a T.
Wishing you the happiest of Thanksgivings! The best of blessings to you and your beautiful family, dearest Gina! Happy Thanksgiving to you and your family, GINA! Yes, it does. Happy Thanksgiving Gina to you and your family. Love it! I think it's such a pretty chalkboard. Have a wonderful, and blessed Thanksgiving. Same to you! Are we gonna see your table setting for Thanksgiving? Yes, I agree!! Eating and drinking are good things - lol!! Hope you and your family have a wonderful "Turkey Day"!!! 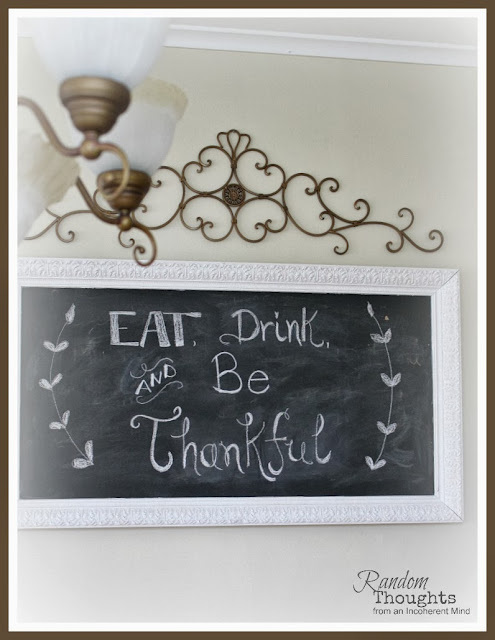 Love your little chalk board message! Wishing you a very happy thanksgiving my friend! Have a wonderful holiday my American blogging friend! !